PORT-AU-PRINCE, Dec 20 2011 (IPS) - “Haiti is open for business.” That’s what President Michel “Sweet Micky” Martelly said at a recent ceremony as he and former U.S. president Bill Clinton laid a cornerstone for a giant industrial zone being built in northern Haiti. Across the country and abroad, Martelly, his government, and their advisors – like Clinton – have been pushing the island nation as a foreign investor’s dream come true. They have good reason to say Haiti is “open for business”. With 15- year tax holidays and – in some cases – massive subsidies, there are deals to be had. Airplanes and hotels are full of foreign investors looking to get in on the ground floor of the post-earthquake reconstruction. Hundreds poured into the capital at the end of November for a two-day conference. 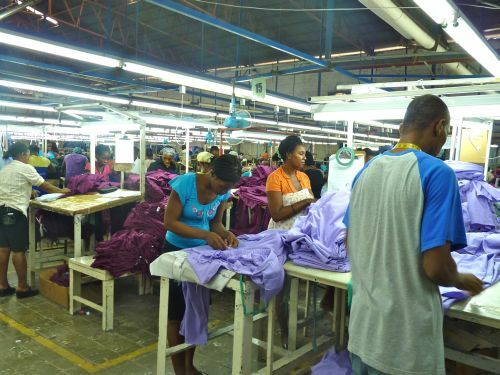 Apparel makers, especially, want to set up shop, according to factory owner Georges Sassine, head of the Association of Haitian Industries. The crisis hasn’t been wasted, at least not by clothing-makers. But a new report from Haiti Grassroots Watch shows that the focus on assembly industries does not represent a big “change”, nor will it necessarily deliver “sustainable development”. Despite the many pitfalls, disadvantages and risks, major Haitian and foreign media have been unanimously supportive of the new park and of Martelly’s focus on foreign investment, using unqualified terms like “hope”, “good news” and “progress”, without even raising questions. But there are definite winners and losers in the gambit. In a new seven-part series, produced after four months of interviews and the review of dozens of studies, the investigative journalism partnership exposed the challenges, risks and arguably erroneous thinking behind the new park and the gamble of betting Haiti’s development on five-dollar a day wages and “the race to the bottom”. “I have a problem with my country, Haiti – I’ve been working in factories here for 25 years, and I still don’t have my own house,” Evelyne Pierre-Paul told HGW. Pierre-Paul, 50, whose name was changed in order to protect her from reprisals at the hands of her boss, doesn’t even rent a house. Before the Jan. 12, 2010, earthquake, she and her three children rented two rooms for 10,000 gourdes (about 250 dollars) a year. But the building was destroyed in the earthquake and she hasn’t been able to save up a year’s rent yet. Twenty-three months after the catastrophe that killed hundreds of thousands, she and her children are still living under a tent in one of the capital’s hundreds of squalid refugee camps. Pierre-Paul’s average daily take-home wage is actually more than Haiti’s minimum factory wage of 150 gourdes, or 3.75 dollars, a day. She earns about 236 gourdes, or 5.90 dollars a day. But that doesn’t cover even one-quarter of what would be considered a family’s most basic expenses. A study by HGW of assembly workers’ expenses in the capital and at the Haiti-Dominican Republic border revealed that on an average day, workers spend more than 50 percent of an average day’s wages just getting to work and back and eating their midday meal. A recent study by the U.S.-based Solidarity Center, which is linked to the AFL-CIO trade union federation, determined that a “living wage” for a worker with two children is 749 dollars a month – almost five times the average monthly wage. Pierre-Paul’s wage – about 150 dollars a month – is far from “living”. She can’t afford to send all her children to school. She can’t even afford to move out of the squalid camp. “When payday comes, you pay all the little debts you accumulated, and you don’t have anything left,” she said. Indeed, in buying power, Pierre-Paul earns less than workers did during the assembly factory boom in the 1980s. At that time, the daily wage was worth about three dollars. Today, measured in 1982 dollars, the minimum factory wage is worth 1.61 dollars. The average wage of 236 gourdes a day – as determined by the HGW study – is worth only 2.53 in 1982 dollars. “It’s a big error to bet on the slave-wage labour, on breaking the backs of workers who are paid nothing while (foreign) companies get rich. It’s not only an error, it’s a crime,” he continued. Pierre-Paul’s boss, One World Apparel owner Charles Baker, admits that he doesn’t pay his workers enough. Baker and other factory owners claim they can’t pay more because of they did, their international clients – like Gildan Activewear, Hanes, Levis, GAP, Banana Republic, K-Mart and Wal-Mart – would pick up and move out. And so the Haitian government – with the full backing of the U.S. government, as recent Wikileaked cables revealed – remains the lowest wage in the hemisphere-wide “race to the bottom”. But Baker insists the assembly industry phase of Haiti’s development is just a “step”. “Yes, it’s a race to the bottom… if you count on it!” Baker said. Baker claims that low-wage, low-skilled assembly industries are temporary, and that they will be a big part of the Haitian economy for only about “10 or 15 years”. “It’s a step. We’re going up the stairs and it’s one of the steps,” he said. The “race to the bottom” pits Haitian workers against workers in the neighbouring Dominican Republic. CODEVI, a free trade zone industrial park in Ouanaminthe, in the Northeast Department opened on the Dominican border about eight years ago, after salaries got “too high”, CODEVI director Miguel Angel Torres told HGW. In the meantime, Baker and other Haitian factory owners remain vehemently anti-union, according to workers like Pierre-Paul and according to a recent study by the United Nations-affiliated International Labor Association/Better Work programme. Indeed, five months later, about a week after textile workers in the capital registered a union, all five union leaders suddenly lost their jobs. Better Work recently ruled the factories should reinstate all union officers but as of Dec. 12, most of the owners had not complied. *This story is the first of a two-part series on the pitfalls, disadvantages and risks of a major new industrial park and the Martelly government’s focus on luring foreign investors to Haiti. It was adapted from a longer investigative series by Haiti Grassroots Watch (HGW).